In this article, Alexandre Vasseur explains how to make use of the rich semantics of the new AspectWerkz 2.x AOP framework and its annotation driven approach to implement a subset of the EJB 3 specification with Java 5: annotation driven Container Managed Transaction (CMT). In this article, Jonas Bonér introduces the new AspectWerkz 2.x architecture. AspectWerkz 2.x has been designed to be an extensible AOP container where any kind of aspects can coexist ranging from Spring aspects to AspectJ aspects. The article explains why this architecture is beneficial to the Java AOP communtity and explains the benefits and drawbacks of running AOP Alliance, Spring and AspectJ aspects within the AspectWerkz Extensible Aspect Container. It concludes with performance figures. AspectWerkz 2.0.RC1 is already available for download here. The last couple of years the Java AOP landscape has flourished. It has gone from one single implementation (AspectJ), to a whole bunch of frameworks, each one with its own way of defining and instantiating its aspects and with its own weaver, runtime environment and tools. Even though having many ways of doing things is not necessary a bad thing, especially not in such early days of a new technology, it is not making it easier for new users of AOP and does not speed up its adoption. When you look at most frameworks out there you can see that they have a lot in common, most of them share same semantics, life-cycle options etc. Most of them have re-implemented concepts introduced by AspectJ and in some cases introduced their own. This is something that we have had in mind when we were designing the new AspectWerkz container and weaver and led us to an open architecture that was easy to extend, an architecture that formed the foundation for the AspectWerkz Extensible Aspect Container. Basically it allows you to plug in extensions that can handle the framework specific details, while the common things are shared. What this brings you is a weaver and a container that can weave, deploy and run any aspect no matter how it is implemented and defined. This introduces many advantages and opens for standardization on tools (development and runtime manageability), but also some risks since it can be hard for one single container implementation to handle both optimal performance and the full expressiveness of all the supported AOP implementations. If we try to illustrate what happens when a method has been advised by a before advice on execution (callee) side, the sequence diagram for the resulting invocation is as follows. This sequence diagram will be the same no matter how the advice has been implemented. The extension implementation for this aspect model needs to define parts like: "how to get an aspect instance? ", while some other parts, like: "how to get the advised member arguments?" are independent of the implementation details of the aspect and should be part of container. The container is responsible of handling the semantic differences between the different aspect models to allow the aspects to coexist in one single runtime environment. AspectWerkz 2.x architecture follows this principle and supports aspect models extension, so that both AspectJ, Spring, AOP Alliance and AspectWerkz aspects can be handled and deployed in a consistent single runtime. Virtually any kind of aspect model can be added to it. 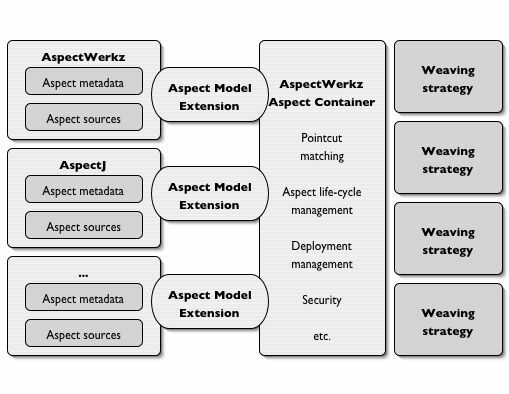 Here is an illustration that shows the high-level architecture of the AspectWerkz Extensible Container and how it interacts with the Aspect Model Extensions and the weaver. Each extension is seen as an Aspect Model and is implemented by implementing the AspectModel interface, but more on that later. One of the extensions that we have already implemented is one that supports aspects that implements the AOP Alliance interfaces. Apart from benefits of having one single weaver and container, one intermediate representation and one container (which handles deployment modules, security, isolation, management etc.) there are many interesting aspects on how we can enhance the user experience of these frameworks. We will continue this discussion using Spring as example, but the same concepts apply to all these frameworks (apart from perhaps JAC, which has a completely different approach). Spring (and all frameworks listed above apart from JAC) only supports a subset of AOP, a subset that is in many cases sufficient for the needs of your application. It does a good job at implementing some of the standard J2EE services and being a starting point for users that are starting to learn AOP. However, when users get more experienced they tend to feel restricted and there are many situations where you need to utilize the rich semantics defined by AspectJ (and implemented by f.e. AspectWerkz and partly by JBoss AOP). But, what is interesting and important is that the limitations these framework have is not necessary in the programming model (the way you implement, define and instantiate the aspects), but how they are weaved. All of them (apart from JAC) are using a proxy based approach to the weaving and this is what mainly limits the expressiveness (although the AOP Alliance and proxy based approaches have not designed an Invocation object that represents a field access/modification or catch handler join points). In the Spring extension we have added support for the features available in Spring but not in AOP Alliance, f.e. before and after advice. For Spring users this means being able to add the pre-packaged transaction interceptor on the caller (client) side, implement client side authentication (reduce network traffic) or implement generic transparent persistance by advising field modification and much more. To make use of these richer semantics in Spring we need a way to define and handle them. We can do that in two ways, either we extend the Spring bean definition to understand and support the new semantics (f.e. add the caller instance to Spring's Invocation class) or we define our Spring aspects using the AspectWerkz definition, either using Annotations or XML. The latter approach actually works really smooth (and we can make it even better if we make use of the SpringAspectContainer to let Spring handle the instantiation, dependency injection and life-cycle management for the aspects). Since the weaver in AspectWerkz 2.x is compiling everything statically, meaning that the output of the weaver is code that is statically compiled and verified, Spring (and any other framework) will benefit from that. Statically compiled code can be highly tuned and optimized and no reflection is needed. This means that we don't have to perform all the expensive plumbing needed in a reflective model. Apart from this, statically compiled code tends to be more predictable than code that is reflectively evaluated. For details on the performance improvements see the benchmark in the appendix at the end of this article. We have also implemented support for running AspectJ aspects inside the AspectWerkz Extensible Container. The aspects on this are very different compared to the Spring extension. AspectJ still supports a richer set of semantics than AspectWerkz so there will be certain aspects that we will not be able to run, but we will on the other hand give the AspectJ users a new dimension of dynamicity (for a large subset of their aspects). When using the AspectJ extension the AspectJ aspects can be weaved into the target application at load time, using AspectWerkz's production stable implementation that is verified to work on all major application servers and JVMs on the market, for Java 1.3 up to Java 5. The AspectJ users will have the possibility of doing hot deployment and undeployment of the aspects, a feature that is based on true runtime weaving and unweaving in the AspectWerkz 2.x architecture. 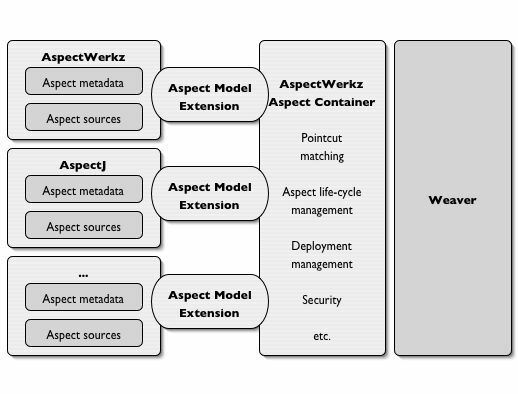 The AspectJ aspects can be packaged in deployment modules that can be deployed at different levels in the class loader hierarchy and will inherit the visibility and isolation of the class loader they are deployed in (just like AspectWerkz's deployment modules packaged with the META-INF/aop.xml deployment descriptor). The users of AspectJ can choose to override the pointcut definition in the aspects using external XML deployment descriptors (the META-INF/aop.xml file). Something that will allow late binding, e.g. the possiblity of taking certain decisions at deployment time and not at compile time. This is something that can be very beneficial in some cases in enterprise application development but is a highly debated topic and should be use with care. If you want to plug in your own AOP or interceptor framework into the AspectWerkz Extensible Container then all you have to do is to implement the org.codehaus.aspectwerkz.transform.inlining.spi.AspectModel interface and the container will manage the weaving, deployment, life-cycle management etc. You need a way of registering your extension and this can be done by adding the fully qualified name of the implementation class to the -Daspectwerkz.extension.aspectmodels=... VM option. Autodetection of aspect models might be added later. Having one single intermediate representation for the aspect (definition/model/plan), regardless of how it is implemented, defined and weaved, and a well-defined API to work with this definition opens up for standardization on tools, both for development and runtime manageability. Support for other frameworks, f.e. JBoss AOP which has a programming model that is somehow similar to AspectWerkz's, would be easy to implement. This is left as an exercise to the JBoss AOP users. Spring extension - supports all advice apart from ThrowsAdvice. Full compatibility will be implemented if the user community finds it of interest. AspectJ extension - still only a proof-of-concept. It does f.e. not support, args(), target(), this(), thisJoinPoint, thisStaticJoinPoint and inter-type declarations. This is something that will be implemented if the user community finds it interesting and worth the effort. We have done a microbenchmark between the AspectWerkz container extensions to AspectJ and Spring, and the regular AspectJ, Spring, JBoss AOP and AspectWerkz frameworks. The numbers in the table shows number of nanoseconds per iteration, where one iteration is the invocation of the advice and the advised method. All advice are doing the same amount of work (incrementing a public static int in another class). Benchmarks where run on a Pentium M 1.60 GHz, 1.0 Go RAM running Java 1.4.2 (HotSpot) and Windows 2000 SP4 without any specific JVM settings. (1) Using an after advice gives the same results. (2) Spring extension - for the user to get all the benefits from the statically compiled approach he needs to make use of direct access to contextual information in the advice. This means f.e. adding the arguments he is interested of to the advice signature, something that will break the Spring API which relies on specific advice method signatures, in particular a the requirement to pass in an object array with the wrapped arguments. It could perhaps be solved using delegation, and lazy and optional creation of the object array. (3) AspectJ extension - the before advice and all the after advice types has the same performance as when using the regular AspectJ weaver (ajc). - First, the regular AspectJ compiler inlines the advice body in the target class, e.g. no closure is created (which is something that the AspectWerkz compiler can't do if it wants to keep the option of possible redefinition of the aspect model. This is the tradeoff for providing dynamicity, runtime weaving and multiple weaving support). - Second, the AspectJ compiled aspect in itself is poorly optimized. Note that argument access is not yet implemented in the AspectJ extension of the AspectWerkz Extensible Container. Jonas Bonér is a Senior Software Engineer at the Java Runtime Products Group, BEA Systems. He is the founder of the AspectWerkz AOP framework and an active contributor to the Java Open Source community.